Respecting clearly defined quality standards is a topic of increasing importance in today’s business processes, both on a national and international level. Constant learning and improvement processes, service, and the capacity to adapt to ever changing markets and customer demands all fall into this category. Last year, Yamato Scale GmbH embarked on a comprehensive program to improve the overall quality of its products and services. The kickoff for this program, named Q10+, was an extensive survey focusing on customer satisfaction which took place last summer. This was followed by the introduction of a quality management system for the entire company based on the DIN-standards ISO 9001. The quality management standards DIN ISO 9000 introduced in 1987 represent the worldwide basis for the quality control and quality management used in many companies in various industries. They are the most widely employed standard reference of the International Organization for Standardization (ISO). The last update of the DIN ISO 9001 took place in 2008. 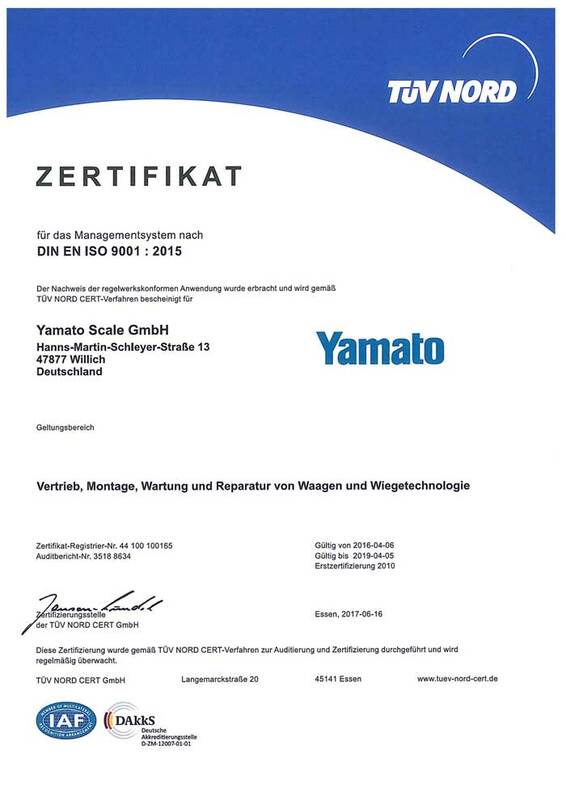 It is according to this latest version that Yamato Scale GmbH is certified. 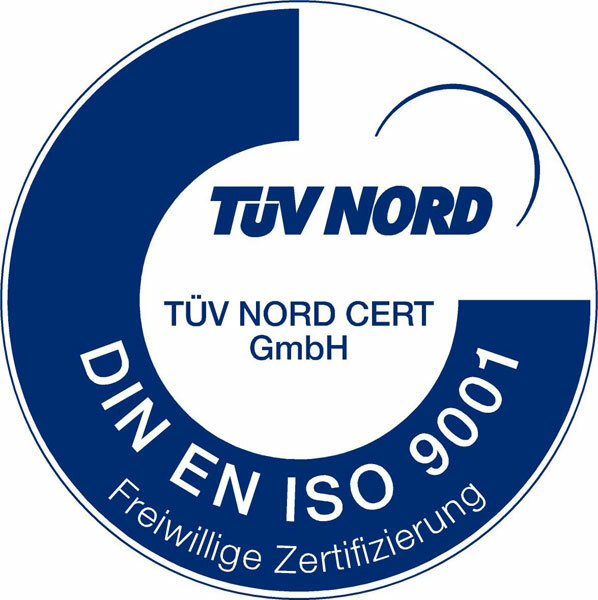 Since high quality standards have always been a focus at Yamato, it only took 6 months of certifying before Yamato Scale GmbH was awarded the final certificate for the standard DIN ISO 9001 by the technical inspection agency TÜV Nord Cert GmbH. The complex requirements faced by international companies can be fulfilled with the help of a quality management system (QM) focusing on standard procedures. Many companies from various industries use this as the basis for their quality control and quality management. However, the success or failure of a company is not only a product of the quality of its various individual services. The willingness and capacity to accommodate changes in the market and in the customers’ requirements quickly, flexibly and innovatively also play an important part. These complex requirements can only be met with an effective quality management system. A QM-system compliant with DIN ISO 9001 is the ideal basis for every national and international company, regardless of size or industry, to prove its competence and performance. This way, a worldwide comparison is possible. The introduction of the quality enhancement system Q10+ is an ongoing process at Yamato, aimed at being continuously adapted and improved. In addition to the two required audits, Yamato Scale GmbH will voluntarily perform three further internal audits in order to further optimize the constant quality control and to ensure an increased efficiency, productivity and customer satisfaction. On a regular basis, the Q10+ program features internal and external trainings for the employees as well as assessments of the suppliers. Furthermore the corporate goals as well as the methods of internal and external communication are clearly outlined and regularly controlled or adapted if necessary. Initiated in 2009, the process of constantly monitoring customer satisfaction is an integral part of Yamato’s corporate communication and will therefore take place on a regular basis. In addition to Yamato Scale GmbH in Willich, Germany, the Yamato corporate headquarters in Akashi, Japan, the Yamato factory in Shanghai, China, and the Yamato subsidiary in Leeds, UK are certified according to ISO 9001. Yamato’s quality management system ensures that our customers always receive the best possible products and services.